Inmotion hosting is one of the popular names in web hosting industry. so let’s start an Inmotion hosting review with its Uptime, Customer support, speed, and Rating. Inmotion hosting is the well-known name in the hosting industry, and I am pretty sure that you all may hear about Inmotion when you are searching for hosting or knowing about hosting. Because Inmotion is one of the best company which shows its standards for its services. And it’s one of the big hosting providers in the world. As the technology is increasing day by day, people like you want to know more about the products or services which they are searching. Now let’s don’t waste time a jump into the Inmotion hosting review 2018. Before jumping you might be wondering to know about the Inmotion hosting, right? So, let’s start the review by knowing about the company. Inmotion hosting is the top rated hosting company; it is a U.S based Hosting company which is serving since 2001. Inmotion offers a wide range of web hosting services like shared hosting, VPS hosting, dedicated hosting, Value plan, Business Plan And different plans in that hosting services. This company is mainly known for its best friendly customer services. And the company also has best technical helpers who can help clients they are lost somewhere. Inmotion is having a customer base of over 300,000 domains and it’s also having the data centers in Los Angeles and Virgina Beach. This company has acquired lots of positive customer rating in the forms of some blogs. And also you can know that by the customers who are still using Inmotion web hosting. Let’s take a look at the features of the Inmotion Hosting. Inmotion hosting is having lots of features, and it also provides all tons of the web hosting services. Along with several plans for each service. Inmotion is mainly known for its customer service and the speed of the web host. So you don’t have to worry about the Inmotion uptime and speed. But in some sort of situations it may not do that well, but presently from past one year, it’s doing well with its speed and uptime. Inmotion hosting offers the free SSD drives, and this is free in all the hosting plans Inmotion provides. Inmotion hosting offers free domain name for 1 year, its same as the other web hosts. It also provides the existing transfers for free. Inmotion is secured all the IMAP email accounts, and you can access emails from any device. It also offers the free 1-click installer, where you can install over 310 applications. Inmotion hosting also offers the free data backups and regular backups. Unlike other web hosts this company doesn’t charge any amount for the backups, you can take the backups for free. Inmotion gives access to SSH access to make your work easier and faster. It also provides the Google apps integration with the easy to use 3 step wizard process. It also offers max speed database where you can get high speed hosting for your site. If you want to develop, then also you can code in more languages like MySQL, Ruby, PHP, PostgreSQL. It offers unlimited disk space, so you don’t have always to check for the disk space used. Inmotion also gives you free advertising credits of $250 and more depending on the plan you take. Inmotion is having 90 days money back guarantee so you can take you’re on or before the first 90 days. It offers free website builder to make your website building easy. It is having the best customer care support and it works for 24*7*365. And it’s US-Based support. These are the features of the Inmotion hosting; all the features are for shared hosting, and you can get more features if you go to another version of web hosting services. Like all the other hosting companies Inmotion hosting is also having some great pros. This company main advantages are in three big sectors those are the speed, uptime and customer support. It also has more pros those you can have a look at the features of the Inmotion hosting which I have mentioned above. As you all know uptime is crucial for any site, and I have been saying that in any review of my articles because uptime is that important factors for websites. Inmotion is having a great Average uptime of 99.96% in its past one year, and that was great because maintaining uptime has been a big challenge to any web hosting companies. 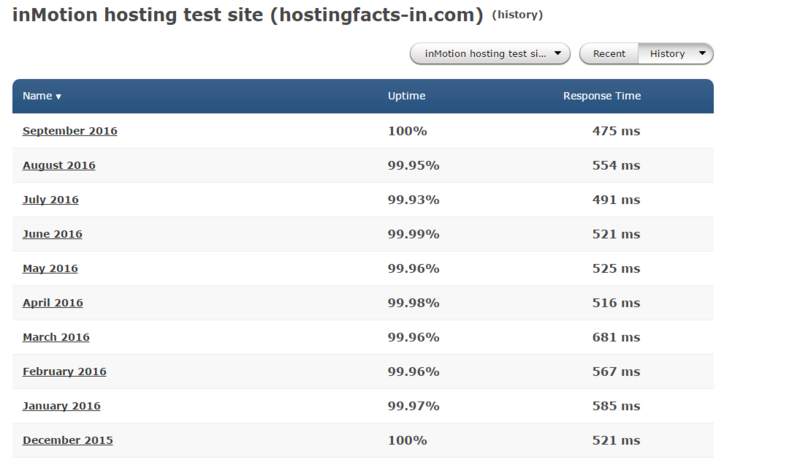 Although they are few hosting which is providing better average it’s having consistency in producing the uptime. These are the average uptimes of the Inmotion in past 6 months. Inmotion is having the best advantage over the other web hosts is, it provides the best speed than many of its competitors. As you may already know that fast loading websites increase the user’s experience and also keeps your websites presence on the web. So, speed is the primary factor where many of the webmasters look at because they wanted speed to go deep into the Google rankings and algorithms. Inmotion hosting provides the best speed and as the test conduction by the hosting facts, they have noticed that they found Inmotion is faster than the 37% of the other web hosts. This is all about the speed reports of the Inmotion hosting. Inmotion hosting is known for its customer support. It is having incredible customer staff where they will resolve any problems under a few minutes of time. As I said Inmotion is the big companies, and so it focuses a lot on the customer services because it is the main way to get their business moving. It quick chat is almost like instant chat they are that fast in responding to your comments and questions and queries as well. But the lagging con of the customer care is: If you’re not from the US, this isn’t usually instant. Generally, you can see almost all the top web hosting companies give the money back guarantee. But mostly you will see around 30 days money back mark but in the Inmotion, it is entirely different. Because they are curious to find the reasons why people quit. And also by keeping 90 days money back guarantee, they believed that people will definitely like their company’s hosting. It’s one of the pro points in Inmotion. Along with this Inmotion features, they are also having other advantages like a free database, free domain, etc. That all pros I have mentioned in the features of this review. Now, these are main pros of the Inmotion now let’s have a look at cons of the Inmotion hosting. Each and every company has its own cons, and they have still something to do with it. So don’t see this cons as very particular problems. I said what I have to say, here are the cons of the Inmotion hosting. Pricing Changes after 24 months of Signup. After 24 months, you can’t have access to the low plan when you started with. And that has been a con of Inmotion. And not only Inmotion, all the others hosting do that but Inmotion’s pricing is pretty high then competitors as well after the 24 months. Inmotion hosting provides great features and all; you also believed in it. Now In their company’s security, Inmotion does go above and beyond the providing free backups and site restoration. They provide backups and recovery for free, but it has limitations. For example, any sites exceeding 10GB in size won’t get the free backed up solution as Inmotion says. If a site exceeds the limit of free backup, then they can only take a backup for every four months they don’t have any other option. If they want a frequent backup solution, then they must spend money around $50. These are the few cons of the Inmotion. Now it’s your time to decide what’s best for you and your site. If you are also looking for the best domain registrar, be sure to check out Namecheap and Godaddy. Or explore more best hosting service providers Bluehost review, SiteGround review, Godaddy, A2 Hosting review to find the right hosting company for your needs. This is all about the Inmotion hosting review 2018. I hope you liked this review. If you have any sort of queries or experience then just let us know in comments. I’d love to hear comments from you. How To Get Free .Com Domain Name For a Year? Hostinger Introduced Business Hosting – Is It Worth Trying? I had used the Inmotion Hosting for quite a long and within that period of time, I can tell you my sort of review for this hosting provider. For me, Inmotion is a far than average, it is a good service provider in the hosting field but there are many things that need to be set-up properly. The after-sale service is good as the customer support responds within no time. But what I have to visit frequently to them every now and then. It has some amazing but beginner level freebies and features. But as a professional, I want the results for my hard earned money that I am putting in the company for a better result. 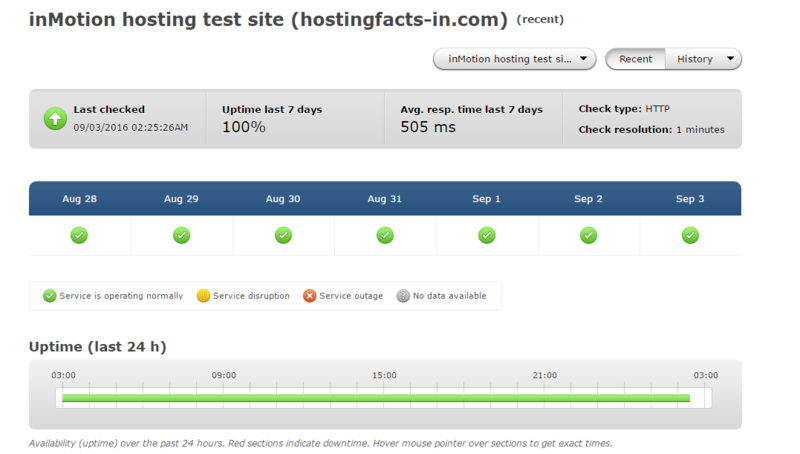 Overall, I give a complete 6 out of 10 to the Inmotion Hosting.